In the heyday of American Western cinema, bestselling author Mickey Spillane wrote a film script for his good friend and Hollywood legend, John Wayne, star of western classics like Stagecoach, The Searchers, and True Grit. 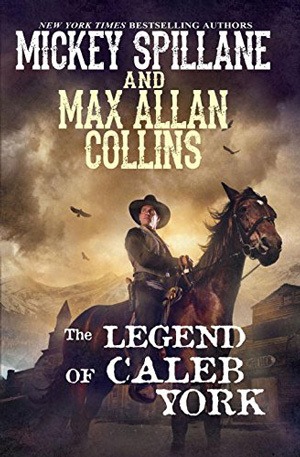 Though the film was never made, Max Allan Collins, Mickey Spillane’s literary partner and executor, has adapted the original screenplay into a hard-hitting, action-packed novel that evokes the classic Westerns of the Duke. Trading his trench coat for a duster and Stetson, Spillane turns out to be every bit as compelling in the western genre as in his immortal detective stories. In this first novel in a bold new Western series, crooked Sheriff Harry Gauge rules the town of Trinidad, New Mexico, with an iron fist. His latest scheme is to force rancher George Cullen into selling his spread and to take Cullen’s beautiful daughter Willa for his bride—whether she’s willing or not. With stirring authenticity and heart-racing drama, Spillane and Collins add Caleb York to the roster of unforgettable western heroes.